DEFENDERbyKarpel puts you in control of discovery disclosure for your office. With redaction/bates number capabilities along with the ability to provide discovery in a purely electronic fashion, you control what gets disclosed and when it gets disclosed. 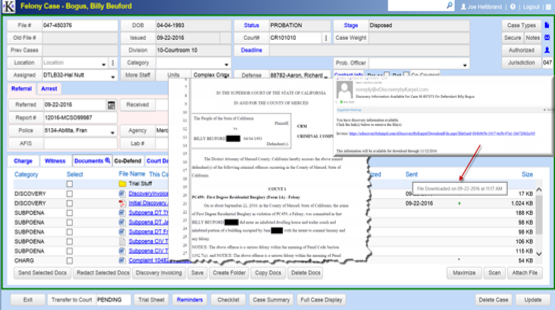 By disclosing discovery electronically DEFENDERbyKarpel provides a full audit trail of when discovery was sent, when it was received, and exactly what was received by opposing counsel. DEFENDERbyKarpel eliminates unnecessary discovery squabbles over what was and wasn’t disclosed to defense counsel. eDiscovery from Karpel Solutions securely delivers discovery efficiently by eliminating paper copies.